A majority of rural Nebraskans support construction of the Keystone XL Pipeline but want it built on a route that avoids the Sandhills and the Ogallala aquifer, according to the Nebraska Rural Poll. The 17th annual University of Nebraska-Lincoln poll was sent to 6,350 households in Nebraska’s 84 nonmetropolitan counties in March and April. Results are based on 2,323 responses. The poll included several questions related to recycling, land and natural resource priorities and the controversial Keystone pipeline, slated to be built to transport crude oil from Canada to Texas refineries. Only 13 percent of respondents said they thought the pipeline should not be built because the environmental risks outweigh the economic benefits. Sixty-one percent disagreed with that position. 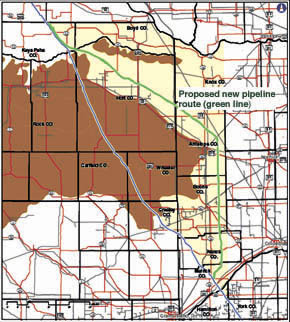 Sixty-five percent, however, agreed the pipeline should be built along an alternative route that avoids the environmentally sensitive Sandhills and Ogallala aquifer; 15 percent disagreed. Details in the Aug. 15 Albion News Print & Electronic Editions.